Jørgen Kieler at the time of his arrest by the Gestapo. Copenhagen, Denmark… September 1943 – Jørgen Kieler and his sister, Elsebet, were active in publishing an illegal newspaper, “Frit Denmark.” Both were members of the Holger Danske resistance group and were involved in the rescue of nearly 1,000 Danish Jews. When Jørgen refused to leave the side of a badly wounded comrade, he was captured and shot and sustained a skull fracture. 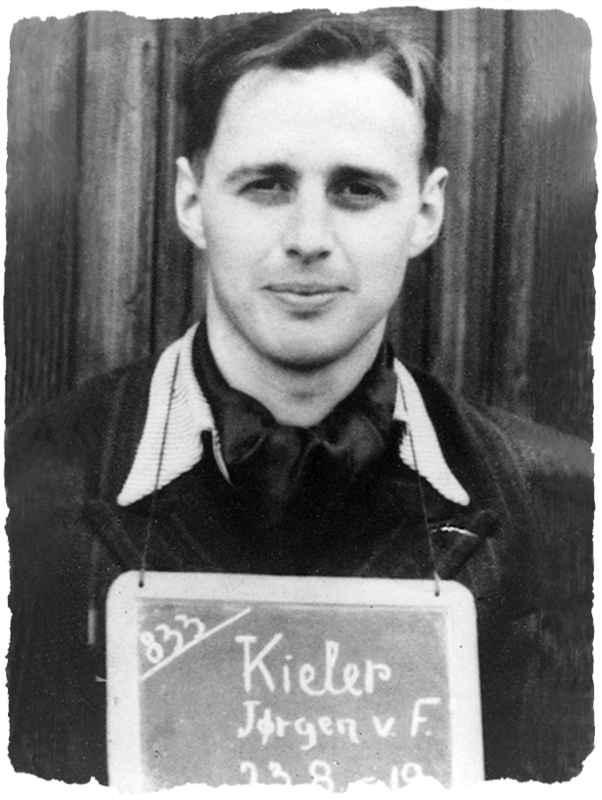 After intense interrogation by the Germans, Kieler was sent to Neuengamme and then to the Porta Westphalica concentration camp. After the war, he became the director of the Danish Cancer Research Institute and served as president of the Danish Freedom Foundation. Elsebet Kieler had long been a committed pacifist. Her first encounter with Nazism was during the 1930s, when, as a high school student, she visited Germany and was shocked and appalled by signs that said “Jews not wanted here.” She then became absorbed in the work of helping Jews to escape to Sweden. In one weekend, Elsebet traveled the Danish countryside collecting over one million kroner from the great estates in and around Copenhagen. This enormous sum was used to pay for the escape of Danish Jews to Sweden. Elsebet, like her brother Jørgen, was imprisoned by the Germans. Elsebet Kieler died in 2006. Dr. Kieler is in his 90s and lives outside of Copenhagen.